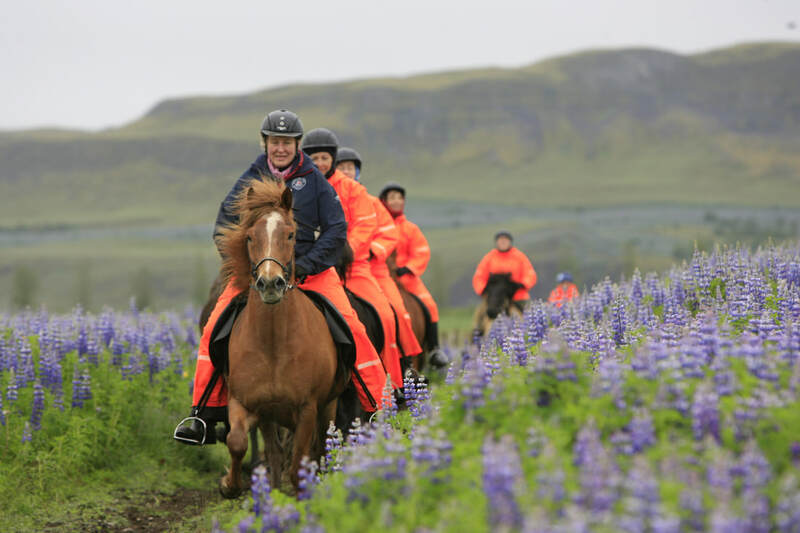 This tour combines an adventurous riding tour with a herd of loose running horses in the Icelandic highland with a very special midnight summer bliss! 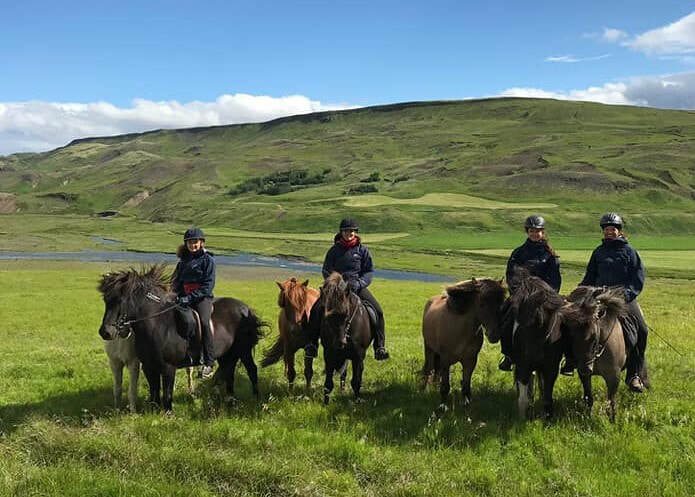 We start with a day of riding lessons to practise the special gait enjoy marvelous views of the Volcano Hekla and the glaciers Langjökull and Eyjafjallajökull. 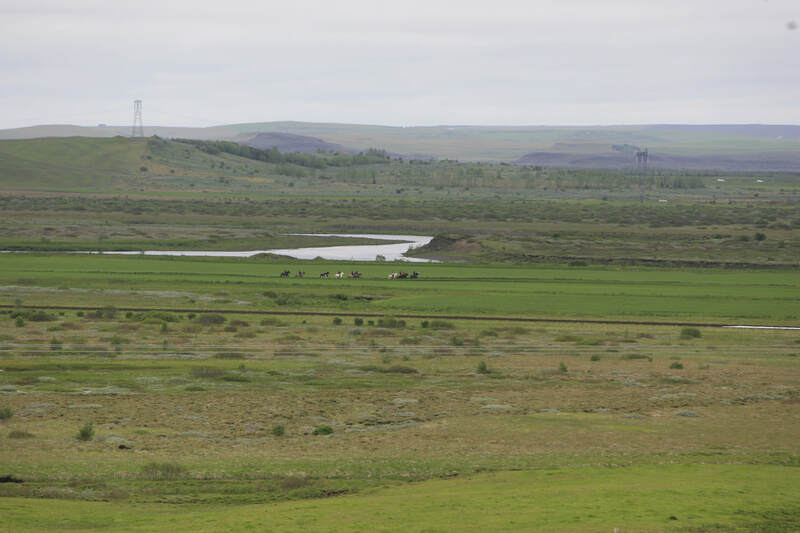 We ride into the uninhabited wilderness north of the romantic valley and follow the mighty salmon river Stóra-Laxá sided by fantastic basalt columns on wonderful tölting tracks. Accommodation is offered in double/twin or single rooms with private sh/wc at the cozy Álftröð country hotel. ​Within seconds, you can be soaking in a hot tub underneath the Midnight Sun. For non-riders we can arrange a special non-riding program during the day! Level of expertise required: Experienced riders in good physical shape. Meals: Full board - we promise good local food! Included: Geothermal Natural bath Secret Lagoon, visit to female ICE-SAR Team, local museums, art studio and home visit to dairy farm among other places. Guide: English / German speaking. Meet & Greet with your guide in Reykjavik at around 9 am. We take a short city sightseeing tour by bus and stop at an Icelandic Tack shop to buy riding gloves and other useful equipment if needed. By bus we go Thingvellir National Park situated right on top of the Mid Atlantic Ridge. This place is heaven for everybody who is interested in Geology and History. We can clearly see the land drop caused by the plates drifting apart. At Þingvellir, the ancient parliament was founded and our guide will take you to all the major points of interest and tell you about the amazing judicial system of the past. 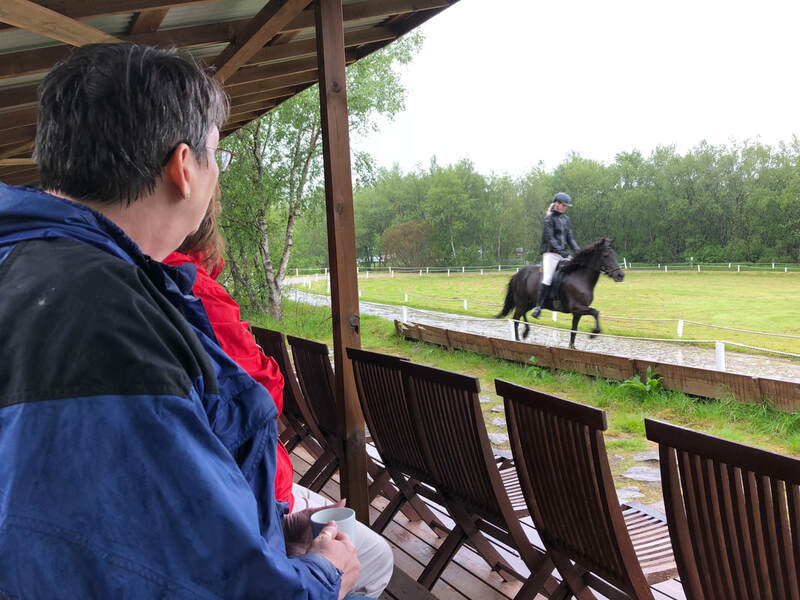 At the Friðheimar Greenhouse Company we enjoy a lovely tomato soup in a very special restaurant and a private horse show showing us the versatility of the Icelandic Horse. We continue to the famous Geysir hot springs and the beautiful Golden Waterfall Gullfoss. Check in at the hotel and enjoy the Welcome Drink and light refreshments. After breakfast short drive to the farm for a short lesson in the indoor arena to get used to the Icelandic way of riding, the tack and the special gait of the Icelandic horse - the smooth and comfortable tölt. Lessons will be for approx. 30 minutes for each group (5 riders at a time). After lessons transfer to local Mika Restaurant for a lovely Langoustine Soup – a real treat! After lunch we have a date with the women of a Mountain Rescue Team and learn everything about their tremendous rescue missions of humans and horses! In the afternoon we go for a short ride around the farm to practice our riding and above all our tölting skills on the trails. 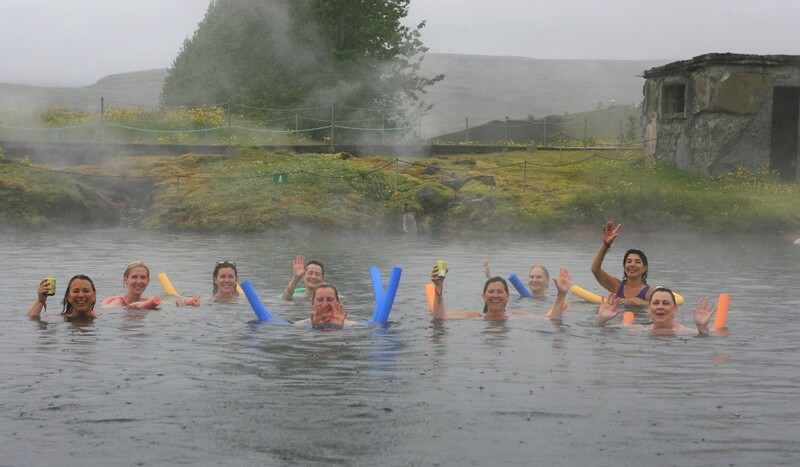 We finish the day with a relaxing bath in the Secret Lagoon and its wonderful geothermal water. The pool´s steam rising into the air gives the place a magical feeling. The warm water keeps a temperature of 38-40° Celsius all year round. Close by there is even a little Geysir which erupts every 5 minutes, showing off for the guests relaxing in the hot spring. Changing rooms with showers are on site. After a long and relaxing bath we return to the hotel for a beautiful dinner with local products. After breakfast return to the farm and start for our highland adventure. We go underneath the basalt columns of Hrepphólar along the canyon of the Stóra-Laxá river. We stop at the little local museum Samansafnið along the way and take a peek into the old days of farming life in Iceland. Here we will enjoy a good picnic lunch. Moving on towards the romantic Hrunaréttir sheep paddock we learn about sheep farming in Iceland and see how the paddock comes in handy for the sheep separating after the round up in autumn. We continue our ride to a local farm where we leave the horses for the night. The riders return after a short drive back to their cozy hotel and hot tubs. (ca. 25 km ride). Part of the day today may be with a free running herd of spare horses if everybody feels up to it. 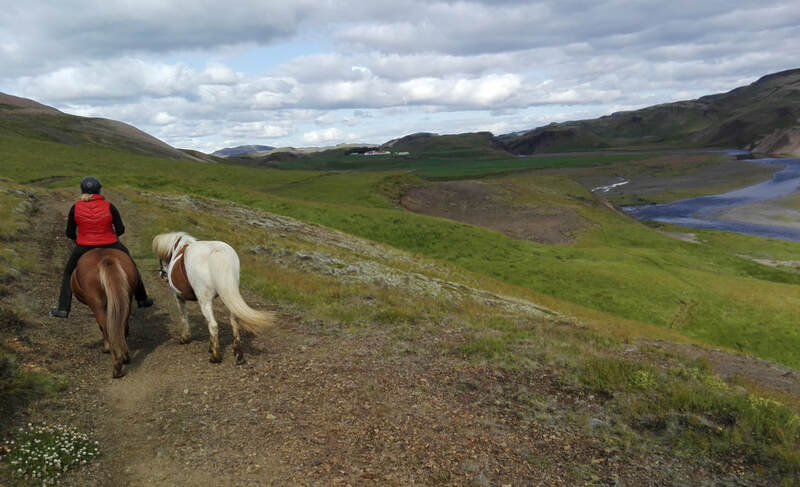 Today we will be tölting after the herd of free running horses through the lovely green and hilly countryside along small family run farms and beautiful views towards the uninhabited wilderness of the romantic valley of Tungufellsdalur. After ride we walk over to the little local parish church where the residing lady who is also a true sewing expert will talk us through the history and making of the Icelandic National Costume. We drive to Waterfall Faxi, a beautiful waterfall where we can walk all the way up to the spraying mist. With a little luck we might spot some wild salmon climbing the salmon ladder next to the waterfall. Return to the hotel for another lovely dinner and relaxation in the hot tub. Please note: Some parts of this ride will be with challenging steep mountain sides and may include leading the horse for short passages. Overnight stay at the hotel and hot tub fun under the Midnight sun. After a last breakfast and check out at the hotel we drive to meet the horses for our last ride. The country lanes through charming countryside with small dairy and sheep farms invite for a fast ride. We stop for another picnic lunch at a dairy farm in a remote valley. We continue on beautiful tracks back to the farm where we have to say good bye to our wonderful horses. (Riding distance ca. 25 km). Drive back to Reykjavík for a last night in the capital. Farewell dinner at good restaurant in Reykjavik. Day 8: Individual transfer to Keflavik airport. Today is the day of departure. We are happy to arrange a visit to the Blue Lagoon or additional sightseeing and nights in Reykjavík. Please note: The visit to the Blue Lagoon must be booked weeks in advance! 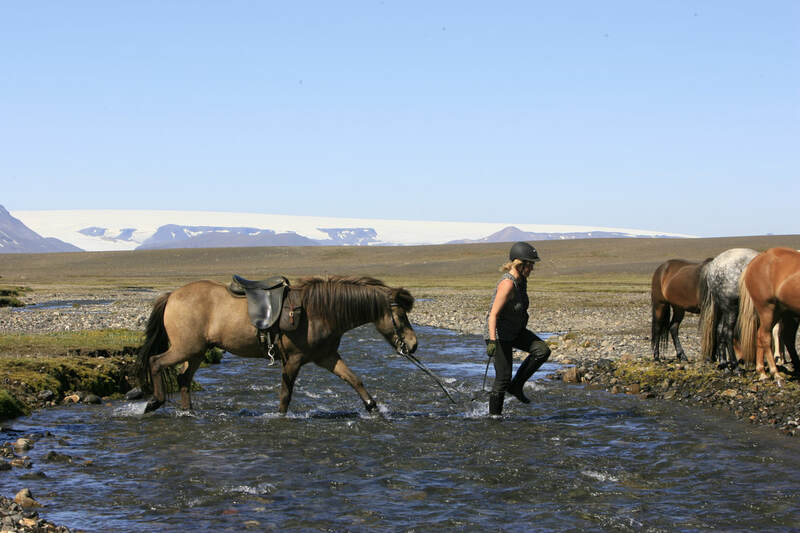 Icelandic Horses are rather small – they look pony size but are actually horses that can easily carry a full grown adult. Just their size makes them so much more „handy“ and less scary. They have a special gait, the tölt, a four-beat gait where the sequence of foot is the same as in walk. This means that at least one foot is on the ground at any time. That being the case, there is no period of suspension within the tölt. This lack of suspension in the gait means it has a smoothness which is extremely comfortable for the rider as there is no time when the horse bounces the rider out of the saddle. A lot of experienced equestrians with back injuries have turned to Icelandic Horses because they are just so much softer to sit than for example a large warm blood horse. Icelandic Horses are known for their exceptionally good character. Even only after a few lessons indoors or in a riding arena you are safe to go out on the trails. They are absolutely adorable with their wild long mane and many colors. 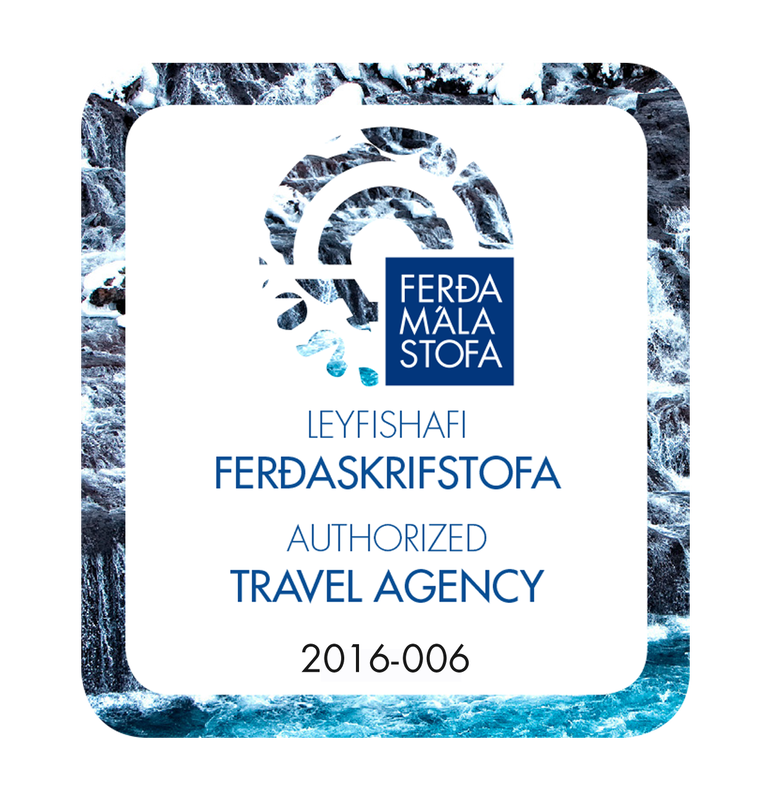 If you have settled on Icelandics – why come to us? We provide a very customer minded Women - only program. We have caring female guides and instructors who are focused on finding the right horse for YOU. The little hotel is situated in beautiful surroundings in the South of Iceland, amid gorgeous landscape with open wide views to the great glaciers of the south and the famous Mt. Hekla. And last but not least – because we care! We are all dedicated horsewomen ourselves and the idea that you should miss out on the wonderful companionship with horses is an unbearable thought for us! We look forward to seeing you in the saddle, girls! 8 days / 7 nights / 6 riding days. Fantastic sightseeing & cultural program. Icelandic home cooked meals with love. All 100 % dedicated staff.